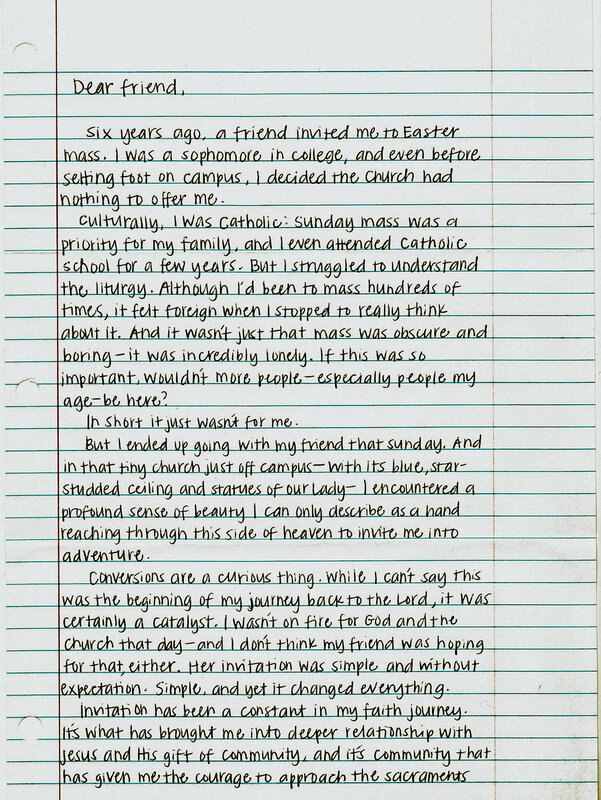 "I was a sophomore in college, and even before setting foot on campus, I decided the Church had nothing to offer me." Six years ago, a friend invited me to Easter mass. I was a sophomore in college, and even before setting foot on campus, I decided the Church had nothing to offer me. Culturally, I was Catholic: Sunday mass was a priority for my family, and I even attended Catholic school for a few years. But I struggled to understand the liturgy. Although I'd been to mass hundreds of times, it felt foreign when I stopped to really think about it. And it wasn't just that mass was obscure and boring, it was also incredibly lonely. If this was so important, wouldn't more people––especially people my age––be here? In short, it just wasn’t for me. "I struggled to understand the liturgy. Although I'd been to mass hundreds of times, it felt foreign when I stopped to really think about it. And it wasn't just that mass was obscure and boring, it was also incredibly lonely. If this was so important, wouldn't more people––especially people my age––be here?" But I ended up going with my friend that Sunday. And in that tiny church just off campus––with its blue, star-studded ceiling and statues of Our Lady––I encountered a profound sense of beauty I can only describe as a hand reaching through this side of heaven to invite me into adventure. Conversions are a curious thing. While I can’t say this was the beginning of my journey back to the Lord, it was certainly a catalyst. I wasn’t on fire for God and the Church that day – and I don’t think my friend was hoping for that, either. Her invitation was simple and without expectation. Simple, and yet it changed everything. "I wasn’t on fire for God and the Church that day – and I don’t think my friend was hoping for that, either. Her invitation was simple and without expectation. Simple, and yet it changed everything." Invitation has been a constant in my faith journey. It’s what has brought me into deeper relationship with Jesus and His gift of community, and it's community that has given me the courage to approach the sacraments and lean into the mystery of the liturgy; to understand the mass, with all its parts, as an encounter with Jesus. Invitation into community has only become more important as I navigate life in the Church as a young adult. When I moved to a new city three years ago, I was attending mass by myself at whatever parish fit my schedule that weekend. However, one Sunday evening––coincidentally Divine Mercy Sunday––a 20-something woman approached me after mass and warmly invited me to a Marian procession happening later that week. I didn’t know what a procession was, but I was thrilled to go simply because she sought me out. "...One Sunday evening––coincidentally Divine Mercy Sunday––a 20-something woman approached me after mass and warmly invited me to a Marian procession happening later that week. I didn’t know what a procession was, but I was thrilled to go simply because she sought me out." Through that event, I met several Catholics my age. Today, I call many of those people my friends, and together we’re working to create authentic Catholic community for young adults in our city. Thanks be to God! It’s these small invitations that remind me I’m seen; that the Church not only wants people like me, but needs me – my story, questions, gifts, presence. And we need you, sister. How will you invite others into the reason for our joy? I think it starts by meeting people where they are. My favorite stories of Jesus are of Him encountering people at work, at home, in their mess or on the road. His invitation to the Kingdom always begins with a simple conversation. It’s a beautiful reminder that invitation doesn’t have to be extravagant to be powerful. In fact, I think invitation looks like small acts of courage, like telling our colleagues what we did on Sunday morning, or sitting next to someone in an otherwise empty pew and saying hello. "How will you invite others into the reason for our joy?" Be courageous, friend. No small gesture goes unnoticed by our Lord. "(Jesus') invitation to the Kingdom always begins with a simple conversation. 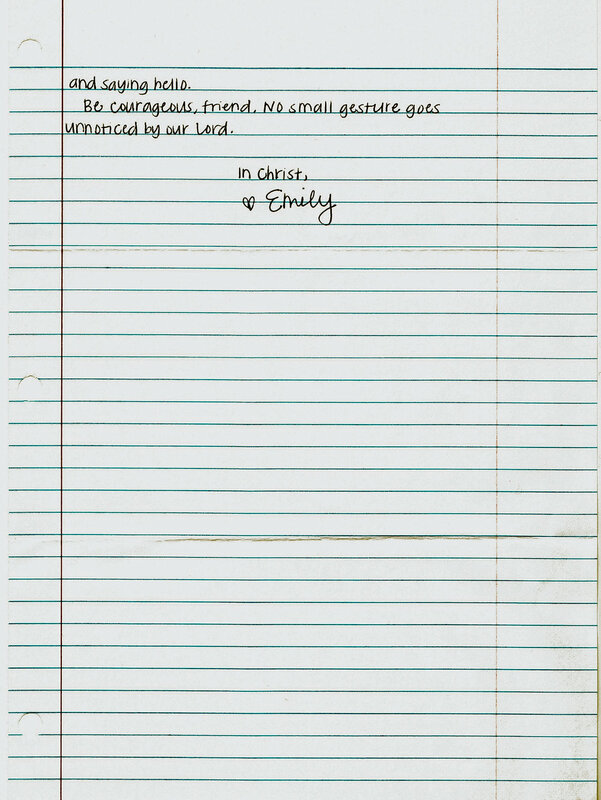 It’s a beautiful reminder that invitation doesn’t have to be extravagant to be powerful. In fact, I think invitation looks like small acts of courage, like telling our colleagues what we did on Sunday morning, or sitting next to someone in an otherwise empty pew and saying hello." Hi friends, I’m Emily. I’m 26 years old, a Catholic revert and an extroverted introvert (INFJ) living in Cincinnati, Ohio. I work as a content strategist for an ad agency, and I get to use my vocation to help grow the Catholic young adult community through media, events and more – and I get to do it all with my dearest friends. How wonderful is that? Next to family and friends, nothing makes me happier than early mornings, that first cup of coffee and thumbing through old books.